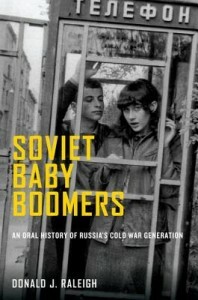 I am happy to launch the fourth “blog conversation” which will be about Donald Raleigh’s recent Soviet Baby Boomers. His excavation of late Soviet society through the medium of oral history is highly readable and I will be recommending it strongly to my students next year. The work draws on interviews with men and women born in 1949/50 who attended two schools: one in the closed city of Saratov and the other in Moscow. Both were prestigious schools and most graduates went on to college and interesting careers: they make lucid and articulate companions to travel through the Soviet Union of the post-Stalin era. Raleigh’s monograph takes us through the different chapters of their lives – childhood, school, college, adult family life, work – and in doing so traces their attitudes towards Soviet power and the wider world. Rather than offering a formal review of the work or summary of its main claims, I thought I would contribute to the blog conversation by focusing on two important issues Raleigh’s book raises. The first is the question of what we should conclude about the mentalities and beliefs of a generation who were adolescents in the 1960s and mature adults when the Soviet Union dissolved. The second topic relates to questions of oral history, narrative, and memory. I begin with the first of these two issues, and hope to return to the second more fully in a later posting, depending on what fellow participants have to say and the direction the conversation takes us. Below I briefly introduce the colleagues who I hope will be joining in the blog conversation over the next few days. When I wrote a review of Russia’s Sputnik Generation, the collection of eight interview transcripts Raleigh published four years ago, I had just finished reading Alexei Yurchak’s Everything is Forgotten Until It was No More. It struck me that the interviewees seemed to support certain of his claims. For example, one of Raleigh’s interviewees, Arkadii Darchenko, a scientific researcher who became a computer programmer in perestroika, seemed to fit with Yurchak’s picture of young people who could embrace Western fashion without rejecting key Soviet values. Darchenko was keen to wear blue jeans, but he still enjoyed participating in the socially useful activities organized by the Soviet state. Several interviewees also seemed to follow Yurchak’s argument that many experienced the Gorbachev era as radical break: it seemed as if Soviet civilization would be “forever” but once the unravelling began, the end seemed perfectly logical and inevitable. The narrative provided by Olga Kamaiurova supported this. She suggested that she and her husband must have been in a “stupor.” Of the omnipresent propaganda she said: “The hammer and sickle was everywhere. Perhaps it even seemed a bit funny. But then, with the advent of information, it all caved in and I saw the light. Good heavens, where had I been earlier? Where were my eyes, my ears, my brain? How could we fall for all this nonsense?” (p. 215). Learning that Raleigh has used his larger archive of transcripts to write his own interpretation of the post-war generation I was interested to know what his own take on Yurchak’s work would be. In his conclusion to the book, Raleigh suggests that Yurchak’s arguments fail to deal adequately with the question of where a Gorbachev comes from. He argues that the “joke-telling” and cynicism shook the foundations of the Soviet system. This made me take stock. It’s certainly true that not all the interivewees’ stories fitted so neatly into the kind of patterns I had identified when reviewing his earlier book. So I thought I’d approach the question from a different angle. Part of the story of the “baby-boomers,” as Raleigh tells it, is about a Cold War generation whose lives had much in common with those of their counterparts in the USA (or indeed in Western Europe): growing numbers attending college, increased leisure time, (relatively) more access to consumer items, and a growing interest in fashion and popular culture. But what was distinctively “Soviet” about it? Some features are obvious. Consumerism, of course, was very different in the context of the USSR: as an outsider it is hard not to be amazed by the absurdity of people from the provinces travelling several hours by train to bring back sausage from the capital, sausage which might even have been made locally. But of course, Soviet citizens were also struck by this absurdity. One feature which comes through strongly for me is the importance of social bonds: friendship, collective voluntary activities, the sociability of the workplace. Informal trust networks might be important in terms of securing a place at university or acquiring coveted goods (sausage again), but the existence of strong, social bonds outside the family were not just about career advancement or economic necessity, I would argue. Raleigh notes the importance of the nuclear family and the increased privacy allowed by the private apartment but he also testifies to the very high levels of divorce amongst the cohort he interviewed. In his portrait, family life seems stretched: certainly many of the women he met seem to see home life as unhappy and strained; the work-place as a site of fulfilment (pp.201-6, 359-60). Work cohorts could holiday together; sometimes couples could not (for logistical reasons). And although perspectives differ, at least some interviewees remember their participation in “voluntary” work-brigades positively (p. 184). There’s a lot of nostalgia for school-days; although such feelings were not universal, the importance attached to friendships seems high. It makes me wonder if the continued ties of friendship, nurtured by class reunions, are stronger and more sustained than is the case for “baby boomers” elsewhere. What also sets Raleigh’s interviewees apart from their peers elsewhere, I think, is their readiness to tell their life-story in relation to a political narrative. In his conclusion Raleigh quotes from Vladimir Mikoyan, one of his interviewees and grandson of a Politburo member: “I don’t regret at all from a political point of view that I was born at that time in this country. I was inspired by these changes. It’s like a gift of history. My children don’t understand that. They’re not even interested” (p. 355) This strong sense of historic destiny is, for me, reminiscent of what Irina Paperno has called the “historicism” of many Soviet men and women who, she suggests in her Stories of the Soviet Experience, viewed their lives in terms of an unprecedented historical process. Although the social cataclysms they endured in the late 1980s and 1990s revised the way they understand their individual and collective past, Raleigh’s interviewees still present their stories as part of an entirely unique, and significant, political experiment, even if the values attached to this experience have shifted. My impression from reading Raleigh’s book is that most of those interviews were comfortable situating their own experiences in relation to key landmarks in Soviet history: the Soviet invasion of Czechoslovakia; Brezhnev’s tenure as leader; the introduction of glasnost’. This is in stark contrast to the (admittedly limited) experience I have of interviewing women from working-class backgrounds. I wrote about one interview I conducted a couple of months ago; since then, an interview with another elderly Baptist from a peasant/ worker background had similar results: fascinating in her account of family and spiritual life, she was utterly perplexed by any questions which tried to situate these stories in relation to national events. Reflecting on these questions first led me to wonder whether part of being “Soviet” meant seeing one’s life in terms of a “gift of history”; but it then made me ask whether this way of thinking was in fact limited to the educated, urban elites with which Soviet Baby Boomers is concerned? So those are my preliminary thoughts and questions, and I look forward to hearing from readers and the other participants in the blog conversation. A little information about the other contributors is provided below. 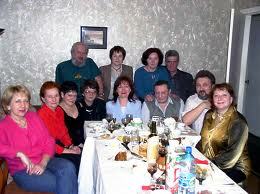 Polly Jones is fellow and tutor in Russian at University College, University of Oxford. Her research has focused on Soviet cultural history with an emphasis on the de-mythologizing of Stalin after his death. She is editor of The Dilemmas of De-Stalinization. Negotiating Cultural and Social change in the Khrushchev Era and co-editor of The Leader Cult in Communist Dictatorships. Stalin and the Eastern Bloc and author of numerous articles and book chapters. Her monograph Myth, Memory and Trauma. The Stalinist Past as Soviet Culture, 1953-69 is forthcoming with Yale University Press. Catriona Kelly is professor at Oxford University. She works on Russian literature and on Russian cultural history, particularly Russian modernism, gender history, the history of childhood, and national identity. She has published a large number of books and articles in these areas, sponsored by grants from the Leverhulme Trust and the British Academy (see http://www.mod-langs.ox.ac.uk/russian/childhood). She is currently leading a large international project on Russian national identity, sponsored by a major grant from the Arts and Humanities Research Council and is working on a study of cultural memory in Leningrad/St Petersburg since 1957, supported by work in archives, interviews, and first-hand observation as well as work with printed sources. Kristin Roth-Ey is Lecturer in Modern Russian History at the School of Slavonic and Eastern European Studies, University College London. Her research concentrates on the intersection of cultural, social, and political dynamics in the post-WWII era. She is especially interested in the history of mass culture – as institutions, technologies, politics, and personal practices – and in exploring its relationship to large-scale social change. Her monograph, Moscow Prime Time: How the Soviet Union Built the Media Empire that Lost the Cultural Cold War, was published by Cornell University Press in 2011. Donald J. Raleigh received his MA and PhD from Indiana University, where he worked with Alexander Rabinowitch. Raleigh taught for a decade at the University of Hawaii before accepting an appointment at the University of North Carolina, Chapel Hill. He spent the first decades of his career studying the Russian Revolution and Civil War, particularly in Saratov province, and the evolution of historical writing in the Soviet Union before turning his attention to the post-WWII period. His most important publications include Revolution on the Volga: 1917 in Saratov and Experiencing Russia’s Civil War: Politics, Society, and Revolutionary Culture in Saratov, 1917-1922. Raleigh currently is working on a biography of Soviet leader Leonid Ilich Brezhnev. Sergei Zhuk is Associate Professor at Ball State University. Before joining the History department there in 2003, Dr. Zhuk taught U.S. history in Russia and Ukraine for many years, and has published three books in Russian and more than twenty articles on colonial American history in English, French and Russian. Dr. Zhuk’s research work now concentrates on history of popular culture, religion and identity in Russia and Ukraine. He has published two major books in English: Russia’s Lost Reformation: Peasants, Millennialism and Radical Sects in Southern Russia and Ukraine, 1830-1917 and Rock and Roll in the Rocket City: The West, Identity, and Ideology in Soviet Dniepropetrovsk, 1960-1985. This entry was posted in Cold War, Nostalgia and Memory, oral history, Soviet Baby Boomers, Soviet Era 1917-1991. Bookmark the permalink.